Marvel’s Spider-Man explores the difficulties Peter faces balancing his normal life with his responsibilities as Spider-Man. The work/life balance aspect of a superhero story is fairly standard yet necessary stuff. It is particularly well suited to Spider-Man as Peter Parker is a teenager who has to attend school, help his Aunt May and be active in his social circle. These things are all impacted by his exploits as Spider-Man as time spent stopping a crime, dealing with an accident or fighting a supervillain is time that he can’t spend maintaining the Peter Parker side of his life. This episode gives nothing new in that regard but that doesn’t mean the approach is a bad one. I give the episode credit for using pacing effectively to establish that Peter is having a really hectic day where there doesn’t seem to be enough time to do everything that he needs to do. He has a project to hand in and a study group to participate in while also finding time to have lunch with Harry and do his job as Max Modell’s Lab assistant. Added to that is a string of robberies conducted by the Black Cat (Grey Griffin) that he tries to stop as Spider-Man. All told it’s a really busy day for Peter Parker and this is reflected through Peter struggling to keep up with everything he has to do. Ever the aspiring scientist he tries to take a scientific approach to his time management by combining the project he has to complete for Doctor Octavius with his heroics by using the Horizon High resources to invent a tracer. He plants this on Black Cat and uses this to follow her to the locations of her various robberies. 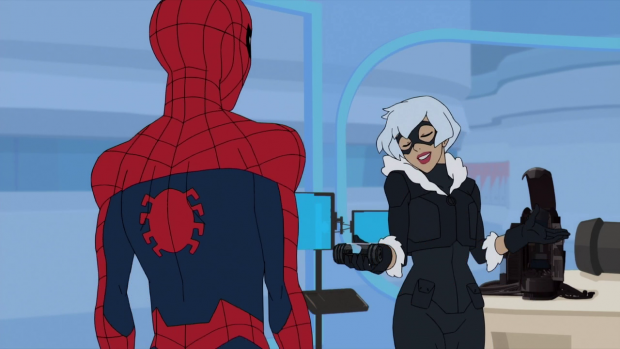 A lot of the episode is devoted to him troubleshooting the tracer as it keeps losing signal meaning that the Black Cat can sneak around to a degree. I like how the tracer problem was handled as it is a background detail that is continually referenced where appropriate. It connects Peter Parker’s problems in his civilian life to the issues he faces as Spider-Man to remind the audience that one aspect of his life impacts the other in a significant way. It also ties into the overall theme of Peter learning as he goes with the tracer not working perfectly right away. It’s a problem that he needs to solve and the events of the episode provide the motivation he needs to solve it quickly. The revelation moment where he figured out why his tracer wasn’t working as intended was nicely done as well as it shows how receptive Peter is to the lessons that are all around him. Well that’s just back luck! The chaotic nature of Peter’s life and the impact this has on others is really well handled. Anya and Miles are his study partners and they are fully committed to their studies but mainly see Peter as being flaky and unreliable. Anya has the strongest reaction with obvious frustration directed at Peter where Miles is more laid back about the whole thing. Both reactions are reasonable and establish information about Anya and Miles as characters. Anya is more impatient and driven where Miles takes life as it comes. I get the impression that Anya is a genius through hard work and self determination while it comes naturally to Miles. Peter is somewhere in-between as he is able to answer the study questions fairly easy. As the audience we have the benefit of knowing what keeps Peter away from his studies and those that count on him to contribute but Anya and Miles just see Peter as someone who doesn’t care enough to show up on time or put in the required work to a collaborative project. The episode does a really good job of balancing these different perspectives and it’s clear that Peter isn’t handling juggling his responsibilities very well. This is a very relatable problem as it is very common to be overwhelmed by things in life even if you don’t happen to be a superhero. 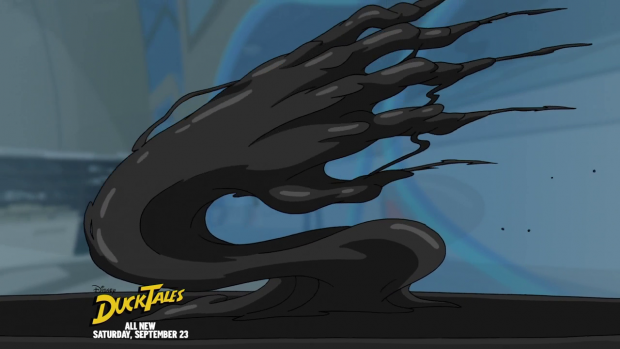 Black Cat is an interesting villain as she is the first in this show who has clearly defined motivations. She mentions early on that stealing the items on her list means that she will get paid which is more than enough to explain why she does what she does. There’s a mystery surrounding the character as nothing is revealed about her backstory, who she is or who hired her. The list of items seems somewhat random as well as it starts with a sample in Max Modell’s possession -which will eventually turn out to be the Venom Symbiote– but also includes a car, priceless comic book, a diamond and a museum piece. I suspect the randomness of the list might be to divert attention from her theft of the symbiote but that remains to be seen. So far she works really well as she is easily able to use her skill to keep the inexperienced Spider-Man on his toes as well as her bad luck powers causing Peter to make stupid mistakes that allow her to escape. Grey Griffin delivers a confident and self assured vocal performance which contrasts nicely with Robbie Daymond’s almost breathless line delivery as he struggles to keep up. Black Cat is completely in control of the situation where Spider-Man definitely isn’t. Giving Black Cat bad luck powers is an interesting touch as this traditionally happens to her far later on. As with everything the episode tries to adopt a scientific approach to this by reminding the audience that there is no such thing as bad luck though it’s unclear what it is Peter does to deal with this. Dialogue makes it clear that he’s offsetting her ability by creating bad luck for her such as making her drive under a ladder and break a wing mirror but it doesn’t really make sense if the episode wants us to realise that there is no scientific basis for bad luck. Other than that the bad luck abilities are used in creative ways. 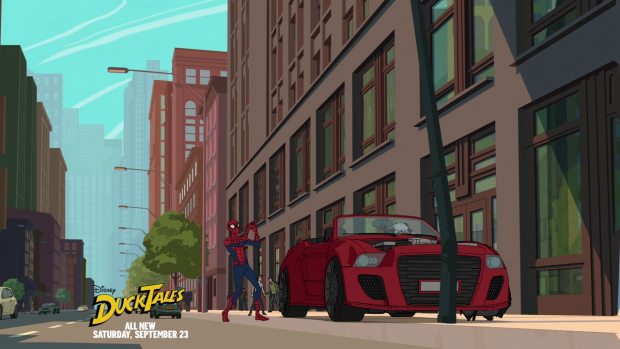 At first they are played for laughs such as Spider-Man trapping himself in his web, tripping up and generally embarrassing himself but they are also shown as being very dangerous when Black Cat uses her powers to crash a truck while placing innocents in danger and making a construction worker use a wrecking ball on the wrong building. The truck sequence was especially impressive as it gave us another example of Peter’s spider sense being used to assess a situation on a scientific level Peter is seen to be working out the angles so that he can figure out who needs to be saved first. It’s one of the more unique interpretations of Peter’s vague spider sense ability I’ve seen and I hope this continues to be used effectively. Gwen’s Uncle Raymond Warren makes a reappearance when he applies for a job at Horizon but is turned down due to accusations lobbied against him in his previous employment. Nothing was ever proven but Max doesn’t want to take that chance. Raymond’s response is what you might expect from a supervillain and he tries to infect Max with something that can be administered from a ring. This backfires thanks to some unknowing interference with Peter and a student ends up receiving whatever the concoction is. It appears to be a tease for a future episode as the student comes into the nurse’s office complaining about an itch. I like what is being done with Raymond Warren so far. The audience knows that he is secretly the Jackal but have no idea what his endgame is so anything he does is seen as being a problem but there is excitement added by the fact that his true intentions remain unknown. It’s clear that being rejected by Max was counter to his plan so whatever he wants to do involves Horizon in some way. This also gives Raymond a reason to hate Max that could translate into a dangerous rivalry as the season progresses. Another impressive outing for this show. Black Cat is an improvement on previous villains as her motivations are clear and a lot is shown about her as a character while still retaining a sense of mystery. She is a good opponent for Peter as her practiced skill combined with her bad luck powers are more than a match for Peter’s inexperience. The solution Peter finds to dealing with her back luck powers could have been a lot clearer but the execution of these as being both comedic and very dangerous was nicely done. Raymond Warren is being developed gradually as a villain so far and it’s really compelling to see as it’s unclear what his plans are. 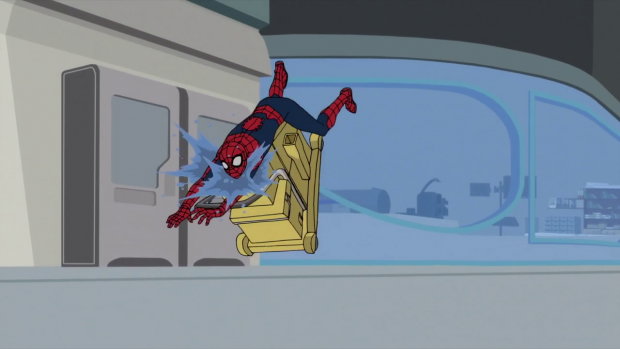 The episode uses its pacing really effectively to communicate that Peter is having a really hectic day balancing everything he has to do between his civilian life and his exploits as Spider-Man. It’s common to explore this in superhero stories and this episode doesn’t bring anything new to the table but it accomplishes what it sets out to do really well and tells us more about the supporting characters.